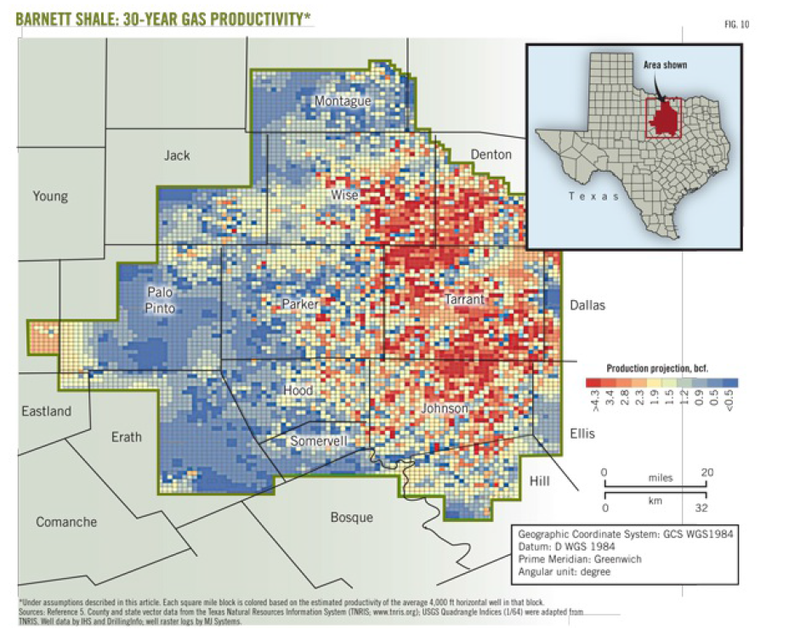 Texas’ Barnett Shale, shown below, is the focus of recent Big Data analytics conducted by the Texas Bureau of Economic Geology. 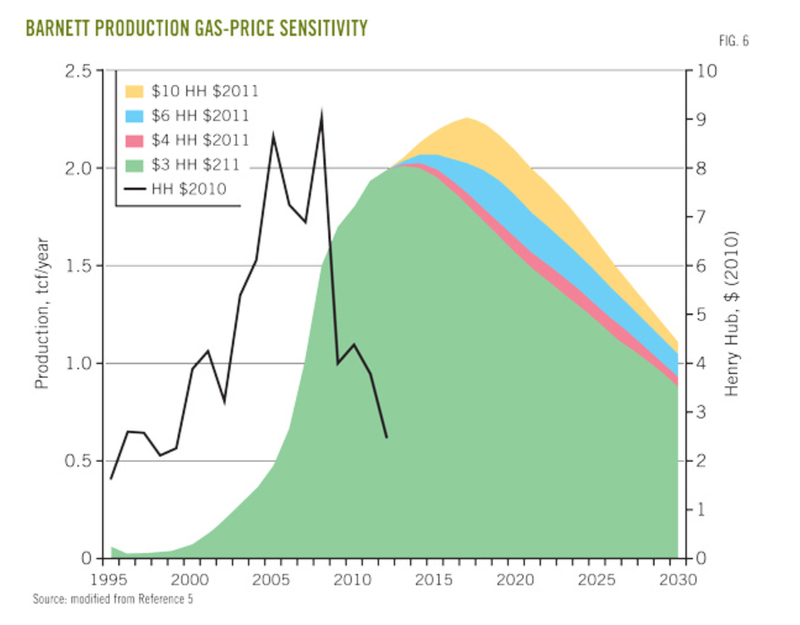 The results provide, among other things, forecasts of when natural gas production from this field will peak – suggesting at current prices that peak production may already have been reached. The Barnett Shale study examines production data from all individual wells drilled 1995-2010 in this shale play in the Fort Worth basin – altogether more than 15,000 wells. 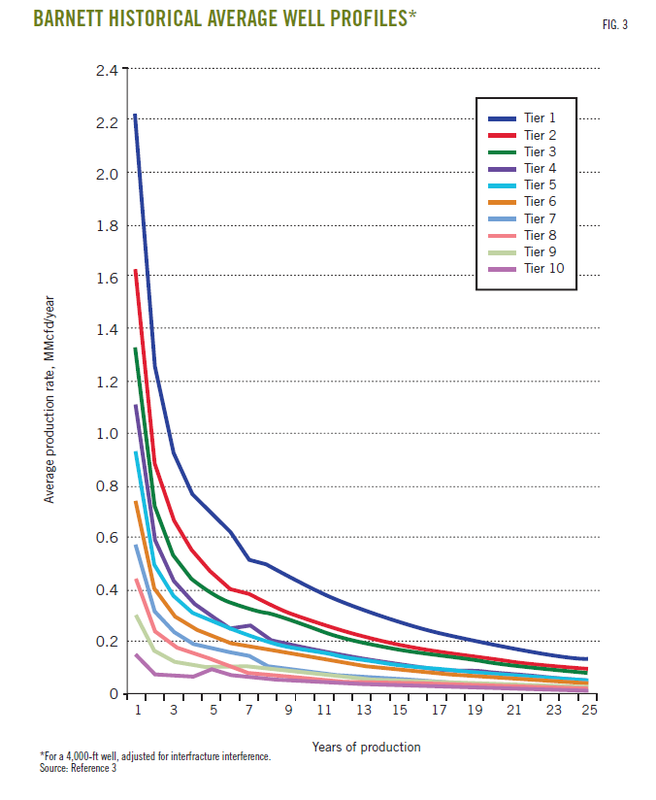 Well-by-well analysis leads to segmentation of natural gas and liquid production potential in 10 productivity tiers, which are then used to forecast future production. Decline curves, such as the following, are developed for each of these productivity tiers. The per-well production decline curves were found to be inversely proportional to the square root of time for the first 8-10 years of well life, followed by exponential decline as what the geologists call “interfracture interference” began to affect production. Econometric analysis of well production, based on porosity and a range of other geologic and well parameters is contained in a followup report Panel Analysis of Well Production History in the Barnett Shale conducted under the auspices of Rice University. Among the most amazing conclusions for me are the predictions regarding total natural gas production at various prices, shown below. This results from a forecast of field development (drilling) which involved a period of backcasting 2011-2012 to calibrate the BEG economic and production forecast models. Essentially, it this low price regime continues through 2015, there is a high likelihood we will see declining production in the Barnett field as a whole. Of course, there are other major fields – the Bakken, the Marcellus, the Eagle-Ford, and a host of smaller, newer fields. But the Barnett Shale study provides good parameters for estimating EUR (estimate ultimate recovery) in these other fields, as well as time profiles of production at various prices.